Seroflo Rotacaps (Generic Advair), are a combination product containing a corticosteroid and a long-acting beta2-adrenergic agonist. Generic Advair (Seroflo Rotacaps) is used for the maintenance treatment of asthma in patients 4 years of age and older as well as maintenance treatment of airflow obstruction and reducing exacerbations in patients with chronic obstructive pulmonary disease (COPD). 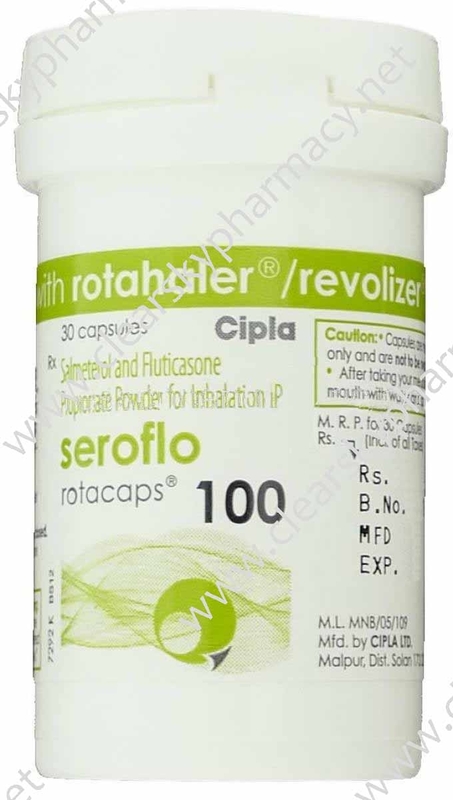 Seroflo Rotacaps (Salmeterol and Fluticasone Propionate powder for inhalation) are manufactured by Cipla Ltd., India, in the strengths of Seroflo 100 Rotacaps (100 mcg of Fluticasone Propionate and Salmeterol 50 mcg), Seroflo 250 Rotacaps (250 mcg of Fluticasone Propionate and Salmeterol 50 mcg) and Seroflo 500 Rotacaps (500 mcg of Fluticasone Propionate and Salmeterol 50 mcg). We also have in stock Generic Singulair (Montair Tablets) which which is also used to treat the same indications. We supply original Seroflo Rotacaps manufactured by Cipla Ltd., India. The active ingredient present in Seroflo Rotacaps are Salmeterol (As Salmeterol Xinafoate IP) and Fluticasone Propionate IP. 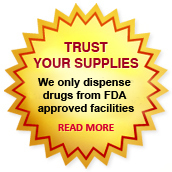 Each rotacap contains 100 mcg, 250 mcg or 500 mcg of Fluticasone Propionate respectively. The quantity of Salmeterol (As Salmeterol Xinafoate IP) remains fixed at 50 mcg. Seroflo Rotacaps, a combination of Salmeterol and Fluticasone Propionate in the form of a Powder for Inhalation are used for the treatment of asthma in patients above 4 years of age as well as a maintenance treatment of airflow obstruction and reducing exacerbations in patients with chronic obstructive pulmonary disease (COPD). We supply Cipla Seroflo Rotacaps which is also known as generic Advair Rotacaps. It is supplied in capsules as an oral dry inhalation powder. To inhale the powder contained in the Seroflo Rotacap (capsule) you must use the Cipla Rotahaler which you can also buy here at Clear Sky Pharmacy. Follow your doctors recommendation when using Salmeterol and Fluticasone Propionate Powder for Inhalation (Seroflo Rotacaps) at all times. As with any medication, you should take Cipla Seroflo Rotacaps (Generic Advair) at the same time every day or you would otherwise have peaks with high or low levels of the medication in your body. This way you obtain the highest efficiency of the medication and maintain a constant level of the active ingredient being absorbed into your body and blood stream. You are also likely to experience less potential side effects. If a medication is prescribed to be taken twice daily in the morning and evening then try to take the dosage exactly 12 hours apart. Asthma: upper respiratory tract infection or inflammation, pharyngitis, dysphonia, oral candidiasis, bronchitis, cough, headaches, nausea and vomiting. Seek immediate medical attention or go to your nearest doctors’ clinic, hospital, or emergency room if you experience an allergic reaction or suffer a hypersensitive reaction such as difficulty in breathing or swallowing, swelling of the limbs or face, tight chest, hives, and skin rashes. Seroflo Rotacaps are contraindicated in patients with a hypersensitivity to Salmeterol or Fluticasone Propionate or to any of the inactive ingredient of the medicine. Seroflo Rotacaps (Salmeterol and Fluticasone Propionate powder for inhalation) are also contraindicated in primary treatment of status asthmaticus or other acute episodes of asthma or COPD where intensive measures are required. Generic Advair Rotacaps are also contradicted in patients with severe hypersensitivity to milk proteins. Cipla Seroflo Rotacaps (Generic Advair Rotacaps) may not be safe or suitable for all patients and you may need dose adjustments to get the optimal level of the active ingredient. Always make sure to tell your doctor if you are pregnant, if you intend to become pregnant, or if you are breastfeeding. You must inform your doctor about any and all medication you are currently taking of has been taking within the last month. This includes prescription medication as well as non-prescription medication (commonly known as OTC or Over-The-Counter), herbal medication, vitamins, and other health supplements. Do not start on a new medication without consulting your doctor or pharmacist about potential drug interactions. Your doctor or pharmacist also needs to know about any allergies you have and if you have other illnesses or medical conditions. You can buy Seroflo Rotacaps (Generic Advair) online from Clear Sky Pharmacy. Seroflo Rotacaps manufactured by Cipla Ltd., are available in strengths of 250 (250 mcg of Fluticasone Propionate and Salmeterol 50 mcg) and 500 (500 mcg of Fluticasone Propionate and Salmeterol 50 mcg) and supplied as capsules in a bottle with 30 capsules. The 250 mcg Seroflo rotacaps cost only $0.56 per unit when you place an order for 360 capsules.